The Academy Award nominations for Art Direction have been announced! Stuart Craig was once again nominated for his very thorough work on Harry Potter. Laurence Bennett and Anne Seibel are both coming into the race with impressive past work. Dante Feretti has already won two Oscars for Art Direction on The Aviator (2004) and Sweeney Todd (2007). If we’re to judge the future on the past, Rick Carter is probably the favorite – and I especially like the use of horse race metaphors for the art director of a movie about a horse – but with his winning the Oscar last year for Avatar and his track record (oops, I did it again) of nominations and amazing sets for movies like Forrest Gump, it wouldn’t be a shock if he won. Although, if I’m going to make my pick, I choose Anne Seibel for Midnight in Paris. I’m a sucker for period set designs and the richness of her design transported Owen Wilson and the audience directly into the Golden Age of 1920s Paris. Yesterday, the mansion that likely inspired F. Scott Fitzgerald to write The Great Gatsby, in 1925, was demolished. The possibility of demolition has had journalists and bloggers talking for a few months now. Lands End in a recent photo shows the home in its condemned state. The mansion was in Sands Point, New York, along Long Island’s Gold Cost. It was called Lands End, and it was built in 1902 by architect Stanford White for the executive editor of the New York World newspaper, Herbert Bayard Swope. News of the possible demolition was featured on the Today Show on March9. It was first brought to my attention on March 12 on a fellow blogger’s website, Cinema Style, where the forthcoming Baz Luhrmann version of The Great Gatsby was discussed. It was reported today on the CBS show, Sunday Morning, that it had been demolished. A view of Lands End in better days. Even though the look and location of this house may have inspired F. Scott Fitzgerald, it was not used in the 1974 film starring Robert Redford and Mia Farrow, as Jay Gatsby and Daisy Buchanan. Lands End would have served as inspiration for Tom and Daisy Buchanan’s house on East Egg, where the “old money” lived. Rosecliff mansion of Newport, Rhode Island. However, the house that was chosen for the film as Jay Gatsby’s mansion, was Rosecliff, a mansion commissioned by Nevada silver heiress Theresa Fair Oelrichs, was completed in 1902 by architect Stanford White. This is surely no coincidence, being built in the same year and by the same architect as Lands End. But, I do wonder why the production designer, John Box, of the 1974 film chose not to, or was unable to use Lands End. Another oddity is that while Lands End was in “East Egg,” Jay Gatsby lived in the nouveau riche “West Egg.” Somehow, I think, the house chosen to portray Gatsby’s mansion would have been an even better replica of the Buchanan mansion. Heatherden Hall in England became the Buchanan mansion in the 1974 movie. The location for filming of the Buchanan House, in the 1974 movie, was actually in England at Heatherden Hall. Beacon Towers built by architect Richard Howland Hunt, 1918. The mansion thought to have been the inspiration for Jay Gatsby’s abode, was Beacon Towers. Built for Alva Vanderbilt Belmont by architect Richard Howland Hunt in around 1918. Richard Howland Hunt was the eldest son of Richard Morris Hunt , who had completed the Biltmore Estate for the Vanderbilt family in 1895. Richard Morris Hunt is one of the most important architects in American architectural history. He was the first American to attend the École des Beaux-Arts in Paris, and brought back with him its sensibility. Though much older than Stanford White, both men were designing the gilded mansions of the elite along the coasts of New York and Rhode Island – a tradition which also carried on into the next generation, as evidenced by Richard Howland Hunt building Beacon Towers. 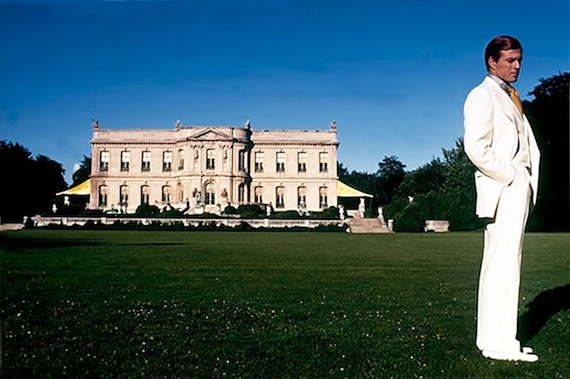 Hammersmith Farm of Newport, Rhode Island was used in 1974 as Jay Gatsbys mansion. In the 1974 Great Gatsby movie, two mansions were used to portray Gatsby’s mansion. In addition to Rosecliff, Hammersmith Farm was used, and to me seems a much better recreation of Beacon Towers. Hammersmith Farm, by architect Robert Henderson Robertson, 1887. Hammersmith Farm was built in 1887 for John W. Auchincloss, by architect Robert H. Robertson. Auchincloss, as it would turn out, was the the great-grandfather of Jacqueline Kennedy’s stepfather, Hugh D. Auchincloss; and Hammersmith Farm was Jacqueline Kennedy’s childhood home. It was later the location of the Kennedy’s wedding reception and their summer house while JFK was President. Robert Redford, as the Great Gatsby in the 1974 movie at his West Egg mansion. While we are still granted the presence of Rosecliff, Heatherden Hall and Hammersmith Farm, Fitzgerald’s original inspirations have been lost. Both Beacon Towers and Lands End have been demolished, in 1945 and 2011, respectively. And I can’t help but wonder if – or hope – that perhaps the 1974 movie helped to raise the importance or value or, at the very least, the recognizability of the mansions used as its sets. With the satellite view above, one can see just how perfectly Beacon Towers and Lands End were situated to inspire Jay Gatsby’s longing views of Daisy Buchanan’s pier with the green light on it. Taking that famous last line of the book, that all the journalist and bloggers have reminded us of over the past few months, “So we beat on, boats against the current, borne back ceaselessly into the past,” let us hope that future movies help to preserve historic architecture, by casting them as characters, as those were in the 1974 movie as the mansions of East and West Egg. Now, you can follow Upstaged by Design on Facebook too! You’ll be notified when I’ve published a new post and when I comment on design and decorative arts I’ve seen on screen. Become a fan by liking Upstaged By Design on Facebook! Thanks for all your support. Now, you can follow Upstaged by Design on Twitter. You’ll be able to see when a new post is up and I can tweet quick notes on historic design in movies. Follow me by subscribing to “upstagingdesign” on Twitter! Enter your email address in the box below and click on the Subscribe button! As in all Fairy Tales, adapt or die. Upstaged by Design · …a perspective on design in movies.